Julian Sanchez is a writer, journalist, and research fellow at the Cato Institute in Washington, D.C. He focuses primarily on issues at the busy intersection of technology, privacy, civil liberties, and new media—but also writes more broadly about political philosophy and social psychology. Before joining Cato, He served as the Washington Editor for Ars Technica, where he covered surveillance, intellectual property, and telecom policy. Prior to that, he was an assistant editor for Reason magazine, where he remains a contributing editor. His writing has appeared in The Los Angeles Times, The American Prospect, Reason, The Guardian, Techdirt, The American Spectator, and Hispanic, among others, and he blogs regularly for The Economist's Democracy in America. He studied philosophy and political science at New York University. The New SOPA: Now With Slightly Less Awfulness! On Thursday, the House Judiciary Committee is slated to take up the misleadingly named Stop Online Piracy Act, an Internet censorship bill that will do little to actually stop piracy. In response to an outpouring of opposition from cybersecurity professionals, First Amendment scholars, technology entrepreneurs, and ordinary Internet users, the bill’s sponsors have cooked up an amended version that trims or softens a few of the most egregious provisions of the original proposal, bringing it closer to its Senate counterpart, PROTECT-IP. But the fundamental problem with SOPA has never been these details; it’s the core idea. The core idea is still to create an Internet blacklist, which means everything I say in this video still holds true. A few days ago, Ars Technica asked me to comment on a class action lawsuit against Paxfire, a company that partners with Internet Service Providers for the purpose of “monetizing Address Bar Search and DNS Error traffic.” The second half of that basically means fixing URL typos, so when you accidentally tell your ISP you want the webpage for “catoo.org,” they figure out you probably mean Cato. The more controversial part is the first half: When users type certain trademarked terms into a unified address/search bar (but not a pure search bar, or a search engine’s own home page), Paxfire directs the user to the page of paying affiliates who hold the trademark. So, for instance, if I type “apple” into the address bar, Paxfire might take me straight to Apple’s home page, even though Firefox’s default behavior would be to treat it as a search for the term “apple” via whatever search engine I’ve selected as my default. Now I think that’s likely wrong. My mistake was in not thinking clearly enough about the mechanics. Because, of course, neither your ISP nor Paxfire see what you type into your address bar; they see specific packets transmitted to them by your browser. And it turns out that the way they pull out the terms you’ve entered in a search bar is, in effect, by opening a lot of envelopes addressed to somebody else. That sort of argument seems to me to be very strongly in tension with the claim that some kind of streamlined or legally enforceable “Do Not Track” option will spell doom for free online content as users begin to opt-out en masse. (Presumably, of course, The New York Times can just have a landing page that says “subscribe or enable tracking to view the full article.”) If you think an effective opt-out mechanism, included by default in the major browsers, would prompt such massive defection that behavioral advertising would be significantly undermined as a revenue model, logically you have to believe that there are very large numbers of people who would opt out if it were reasonably simple to do so, but aren’t quite geeky enough to go hunting down browser plug-ins and navigating cookie settings. And this, as I say, makes me a bit uneasy. Because the hidden premise here, it seems, must be that behavioral advertising is so important to supplying this public good of free content that we had better be really glad that the average, casual Web user doesn’t understand how pervasive tracking is or how to enable more private browsing, because if they could do this easily, so many people would make that choice that it would kill the revenue model. So while, of course, Adam never says anything like “invisible tradeoffs are better than visible ones,” I don’t understand how the argument is supposed to go through without the tacit assumption that if individuals have a sufficiently frictionless mechanism for making the tradeoff themselves, too many people will get it “wrong,” making the relative “invisibility” of tracking (and the complexity of blocking it in all its forms) a kind of lucky feature. There are, of course, plenty of other reasons for favoring self-help technological solutions to regulatory ones. But as between these two types of arguments, I think you probably do have to pick one or the other. Jim Harper and I have been having one of our periodic tussles over the Lower Merion school laptop spying case. Jim thinks the search in this case may pass Fouth Amendment muster; I disagree. This is especially tricky because the facts are still very much unclear, but I’m going to follow Orin Kerr in assuming that the facts are roughly as follows. (I also, incidentally, follow Kerr in his conclusions: The statutory claims are mostly spurious; the Fourth Amendment claim is legitimate.) Harriton High School issues its students personal laptops, which are required for class, and normally are also taken home by the students. Student Blake Robbins, however, had apparently been issued a temporary “loaner” laptop while his normal one was in for repairs. According to school rules, this laptop was supposed to remain on campus because he had not paid an insurance fee for it, but he took it home with him anyway. Exactly what happened next is not entirely clear, but at some point someone at the school appears to have registered it as missing on the school’s asset management and security system. The system works as follows. Each laptop periodically checks in with the school server whenever it is online—it sends a “heartbeat”—registering its identity, the IP address from which it’s connected, and some basic system data. It also, among other things, checks whether it has been reported missing or stolen. If it has, depending on the settings specified, it activates a security protocol which causes it to check in more frequently and may also involve taking a series of still images with its built-in webcam and submitting them back to the server for review. One of those images, presumably because it showed something the school’s techs thought might be drugs, was subsequently passed along to a school administrator. Again, any of this could be wrong, but assume these facts for now. Since some of my cobloggers have taken to using the phrase “Privacy Paternalists” to describe some advocates of privacy regulation, I want to suggest a distinction growing out of the discussion on Berin’s Google Buzz post below. I think that it’s clear there is such a thing as a “privacy paternalist”—and there are not a few among folks I consider allies on other issues. They’re the ones who are convinced that anyone who values privacy less highly than they do must be confused or irrational. A genuine privacy paternalist will say that even if almost everyone understands that Amazon keeps track of their purchases to make useful recommendations, this collection must be prohibited because they’re not thinking clearly about what this really means and may someday regret it. There’s actually a variant on this view that I won’t go into at length, but which I don’t think should be classed as strictly paternalist. Call this the “Prisoner’s Dilemma” view of privacy. On this account, there are systemic consequences to information sharing, such that we each get some benefit from participating in certain systems of disclosure, but would all be better off if nobody did. The merits of that kind of argument probably need to be taken up case-by-case, but whatever else might be wrong with it, the form of the argument is not really paternalistic, since the claim is that (most) individuals have a system-level preference that runs contrary to their preference for disclosure within the existing system. With China’s Internet filtering back in the spotlight, this is as good a time as any to rewatch Clay Shirky’s excellent TED talk on the political implications of the ongoing media revolution—with a fascinating case study of a recent episode in the People’s Republic. Two points that probably deserve emphasis. The first is that the explosion of user generated content in one sense makes the control of search engines even more important for a regime that’s trying to limit access to politically inconvenient information. You can block access to Amnesty International, and you can even try to play whack-a-mole with all the mirrors that pop up, but when the ideas you’re trying to suppress can essentially crop up anywhere, a strategy that relies on targeting sites is going to be hopeless. The search engine is a choke point: You can’t block off access to every place where someone might talk about the Tiananmen massacre, but if you can lock down people’s capacity to search for “Tiananmen massacre,” you can do the next best thing, which is making it very difficult for people to find those places. There are always innumerable workarounds for simple text filters (“Ti@n@nm3n”) but if people are looking for pages, the searchers and the content producers need to converge on the same workaround, by which point the authorities are probably aware of it as well and able to add it to the filter. It’s the same reason people who want to shut down illegal BitTorrent traffic have to focus on the trackers. The second point, however, is that social media also erodes the value of the search engine as a choke point, because it transforms the community itself into the search engine. For many broad categories of question I might want answered, I will get better information more rapidly by asking Twitter than by asking Google. Marshall McLuhan called media “the extensions of man,” because they amplify and extend the function of our biological nervous systems: The screen as prosthetic eye, the speaker as prosthetic ear, the book or the database as external memory storage. The really radical step is to make our nervous systems extensions of each other—to make man the extension of man. That’s hugely more difficult to filter effectively because it makes the generation of the medium’s content endogenous to the use of the medium. You can ban books on a certain topic because a static object gives you a locus of control; a conversation is a moving target. Hence, as Shirky describes, China just had to shut down Twitter on the Tienanmen anniversary, because there was no feasible way to filter it in realtime. An analogy to public key encryption might be apt here. The classic problem of secure communications is that you needed a secure channel to transmit the key: The process of securing your transmission against attack was itself a point of vulnerability. You had to openly agree to a code before you could start speaking in code. The classic problem of free communication is that the censors can see the method you’re attempting to evade censorship. Diffie-Hellman handshaking solves the security problem because an interactive connection between sufficiently smart systems lets you negotiate an idiosyncratic set of session keys without actually transmitting it. A conversation can similarly negotiate its own terms; given sufficient ingenuity, I can make it clear to a savvy listener that I intend for us to discuss Tienanmen in such-and-such a fashion, and the most you can do with any finite set of forbidden terms and phrases is slow the process down slightly. This is a big part of why, pace folks like Tim Wu, I’ll still allow myself to get into the spirit of ’96 every now and again. They can, to be sure, resolve to shut down Twitter and try to throw enough people in jail to intimidate folks into “self discipline,” as they charmingly term it. But the strategies of control available become hugely more costly when the function of the medium is less to connect people with information than to connect them to each other. First, the traditional physical distinction between inside and outside should be replaced with the online distinction between content and non-content information. Second, courts should require a search warrant that is particularized to individuals rather than Internet accounts to collect the contents of protected Internet communications. These two principles point the way to a technology-neutral translation of the Fourth Amendment from physical space to cyberspace. I’ll let folks read the full arguments to these conclusions in Orin’s own words, but I want to suggest a clarification and a tentative objection. The clarification is that, while I think the right level of particularity is, broadly speaking, the person rather than the account, search warrants should have to specify in advance either the accounts covered (a list of e-mail addresses) or the method of determining which accounts are covered (”such accounts as the ISP identifies as belonging to the target,” for instance). Since there’s often substantial uncertainty about who is actually behind a particular online identity, the discretion of the investigator in making that link should be constrained to the maximum practicable extent. The objection is that there’s an important ambiguity in the physical-space “inside/outside” distinction, and how one interprets it matters a great deal for what the online content/non-content distinction amounts to. The crux of it is this: Several cases suggest that surveillance conducted “outside” a protected space can nevertheless be surveillance of the “inside” of that space. The grandaddy in this line is, of course, Katz v. United States, which held that wiretaps and listening devices may constitute a “search” though they do not involve physical intrusion on private property. Kerr can accomodate this by noting that while this is surveillance “outside” physical space, it captures the “inside” of communication contents. But a greater difficulty is presented by another important case, Kyllo v. United States, with which Kerr deals rather too cursorily. Ok, I didn’t say anything last month when Jerry—albeit with some caveats—cited that FCC stat about how 88 percent of zip codes have four or more broadband providers. But now I see my friend Peter Suderman relying on the same figure over at Reason. And friends don’t let friends use FCC broadband data. First, since a zip code is considered to be “served” by a provider if it has a single subscriber in that area, this is not a terribly helpful measure of competition, which is a function of what you can get at any given household. More importantly, the definition of “broadband” here is a blazing 200 Kbps unidirectional—or about 1/20th the average broadband connection speed in the U.K., itself the slowpoke of Europe. A third of the connections they’re calling “broadband” don’t even reach that pathetic speed bidirectional. Of the 2/3 that do manage to reach that speed both ways, almost half are slower than 2.5 Mbps in the faster direction. Mobile companies are by far the most common “broadband” providers in their sample, with “at least some presence” in 99% of their zip codes, so at least one of those four providers is almost certainly a mobile company. It’s probably a lot more than that: In only 63% of zip codes were both cable and ADSL subscribers reported—and remember, that doesn’t even tell us whether any households actually had even the choice between a cable and an ADSL provider. So we can see how easily you get to four providers under this scheme: You just have to live in a zip code with, let’s say, an incumbent cable company offering what passes for “real” broadband in the U.S., plus even spotty coverage under a 3G network (average downstream speed 901–1,940 Kbps, depending on your provider) , and a couple of conventional cellular carriers with Edge or EVDO coverage that just squeaks over the 200 Kbps bar. 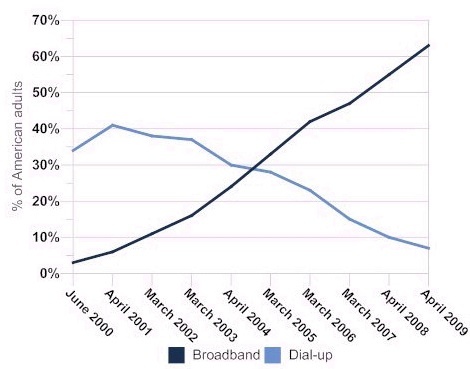 Congratulations, you’re a lucky beneficiary of U.S. “broadband competition.” Woo. Look, I think the average person in this country understand that their broadband options are pretty crap, and there’s not much percentage in telling them to ignore their lying eyes and check out some dubious numbers. If the argument against net neutrality depends on the idea that we currently have robust competition in real broadband, well, the argument is in a lot of trouble. What I find much more compelling is the idea that, with 4G rollouts on the horizon, we may actually get adequate broadband competition in the near-to-medium term, and might want to be wary about rushing into regulatory solutions that not only assume the status quo, but could plausibly help entrench it. Addendum: That Pew survey I cited in the previous post did ask individual home broadband subscribers how many providers they had to choose from. Obviously, that sample excludes people without any broadband access, but 21% (and 30% of rural users) said they only had a single provider, and only a quarter of those who had multiple providers said they had as many as four. Since average prices appeared to be lower the more competition was present, and assuming ceteris paribus you get higher adoption when prices are lower, this sounds likely to overstate the actual degree of choice Americans enjoy. I, for one, am a little concerned that in all this technology talk, particularly with respect to government agencies moving information online, not a word was mentioned about the Digital Divide. It’s not news that low-income people of color and women are devastatingly impacted by decreased access to technology. But as states and state agencies experience budget constraints, activists must keep an eye out to insure that these creative measures are sensitive to the needs of these communities. Data consolidation is one thing, but how will “automated government services” impact consumers? More specifically, how much computer literacy will be needed to interact with these agencies? I’m not saying that agencies should stay in the Stone Age per se; But, before these agencies pull a George Jetson, they should assess the technological literacy of their communities through surveys or other methods. Also, they should use some of the savings from implementing these new high tech programs to invest in more free Wi-Fi hotspot locations and free technology education workshops–that run at night and provide childcare.